A grassroots storytelling movement from the Muslim American community. Founded Jan 2014 with chapters in NYC SF DC Toronto & more. Join us! The Jadeed Voices Initiative is a special project by the Muslim Writers Collective which offers a platform to reflect on our faith and the diversity among us by highlighting the exigency of promoting nuanced, multifaceted perspectives. We will be sharing one narrative a day from July 8-19. For more information about this initiative, please visit our author page, and follow the Muslim Writers Collective on Facebook and Twitter. The few truths I know come from here: out of wet mouth and shuttered eyes, in hospital chairs across my shallow-breathing grandmother, reduced to organs and machinery. Tomorrow she will leave this world. "Your Daadi was a hero," Papa says. "Did you know?" I shake my head. But of course I know. Daadi was widowed with five children in the time of the Bangladeshi independence. Her husband murdered in racial riots, she alone brought her children from Dacca to Bihar, India, and finally to Karachi, Pakistan. A young woman with young children fleeing penniless from patriarchy to new patriarchy, emerging unscathed. Making it finally to America where the conflict of her youth resumed inside her. Who but a hero could accomplish such feats? These facts I have pieced together through careful eavesdropping of late night calls to Pakistan; from Daadi's other-worldly moans--her garbled Urdu through her sleep. From Papa and his siblings' taciturn recounts of their adolescence; from the way he, loud-voiced and trembling, advises my brother and I not to take him for granted--we may lose him any day, just as he lost his own father. But I shake my head all the same. "Tell me," I say. I want to know the story, and Papa rarely offers to tell. There is no once upon a time, no fairy-tale wilderness. There is only Dacca, East Pakistan, 1971. "On the day my father died," Papa begins, "your Daadi went to look for him. The riots were over, but still, it was not safe for a woman to be outside. On the road, she saw two men drag another man into a house and lock the door from behind. They were going to kill him. But she went after them--banged on the door and screamed. Luckily, an officer saw her and intervened. She saved a life that day. Those men would have killed her too." Story over. Again we stand in silence. And then what? I want to ask. And then what happened? But the words never leave my tongue. It feels wrong--greedy--to ask for more. Through my father, I understand culture, and Papa's culture is subtlety. Stories like his are painful, sacred presents: best kept fermenting in silence until precisely the right time; best delivered in small enough dosage to keep sober. Young Daadi shakes between smoldering bungalows while whispering the verses of Ya-Sin for protection. She steps through hacked mango boughs and onto the gravel road. Nauseous from the smell of carnage, the wailing of women and children around her, she calls for her husband--Muhammad! Muhammad! But every fifth man in East Pakistan is Muhammad, and even so, no one answers. Suddenly Daadi witnesses the struggle--the thrashing, kicking, pleading. A man, as dark-haired and handsome as her husband, bleeds profusely as he is dragged up the porch steps and pulled through a narrow doorway. She deliberates momentarily before scrambling up those steps, bringing her small fists to the wood--she saves a life. I watch Daadi across from me now. I've never had the words in Urdu to ask her for the full story, and if i did she would skirt my questions with words of love. Approaching stillness, she is closed-eyed and almost bald, her skin like elephant leather, her legs pitted like cheese curd. Hip-fractured and half-blind, the features of her youth are now wilted, indecipherable. But my father's image of her as heroine makes it easy for me to imagine her fire-eyed and lithe--a most valiant and faultless version of myself, but with higher cheekbones, sharper nose, longer hair, straighter back. A full Bollywood heroine, with sweat-moistened salwar and rivulets of kohl dripping from her eyes, searching for her husband in a country on fire with revolution. This must be the climax. I myself have never known such fear or bravery; I've never been tested with another's life over my own or undergone the trauma of brutal, unjust loss. This is my understanding of crisis: Daadi's ebbing life, and the stories she will take with her. It is not empathy or sadness I experience when I imagine myself in Daadi's stead--but rather, guilty, stomach-prickling excitement. When I try to understand the parts of myself that are Pakistani, how do I know what is Daadi and what is her culture? How do I know what is my own sensationalizing and what is the truth? How do I separate East Pakistan from the movies? In the years to follow Daadi's death, Papa will sometimes find it opportune to tell me more: flashes of the migration after his father's murder, brighter stories of his sisters' weddings in Karachi. In these moments, I feel more questions in my throat--where did you stay? What did you eat? What colors did you wear? Who was there to support you through it all? Some of these I find the courage to ask; some of them Papa answers inadvertently. In Bihar, with our cousins, we ate biriyani like kings... Either way, they will be no more than bullets on a storyboard. The rest--the calligraphy-embossed doors, the calls to prayer, the tandoors on the road, the grey ocean--everything I have filled in with my own reading and watching and living--the rest is fiction. "Take me back with you," I say to my father soon after Daadi passes away. "Take me where you grew up." "One day," he promises. "One day, I'll tell you the whole story." It's an exciting promise, one I hold in my heart and remember often. One day, we will retrace his steps from Dacca to Karachi; together we will try to recall those experiences, those feelings. But I know it will entail just as much discovery for Papa as for me--the places of his youth were likely razed and rebuilt; the landmarks (a corner-store, a schoolhouse, a swimming-hole) perhaps long lost and replaced with familiar industry. Repopulated, renamed. We can never return to East Pakistan--it no longer exists. Papa has given me nearly all that he has: his features, his color, his faith. But willing or unwilling, his memories are his own. No matter how much research or travel I do, no matter how much probing, I will forever be one generation--fifty turns of the world--removed from his childhood. Still, I wait for when I will receive all the plot points. That day I, myself, will assemble the screenplay, roll the reel with color and language and tradition and smoke. I will cast myself as the lead, walk the illusory steps, and imagine Daadi's fear until I believe it--until I discover it within myself. Perhaps then, I will finally begin to understand where I come from and where I belong. 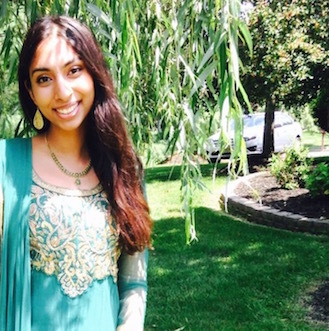 Anitha Ahmed is a second year medical student at Thomas Jefferson University. Inspired by writers like Maxine Hong Kingston and Jhumpa Lahiri, she finds her cultural identity and faith sources of intrigue, pride, and sometimes alienation. She seeks healing and self-discovery through art, and hopes to eventually marry her craft with her medical career.